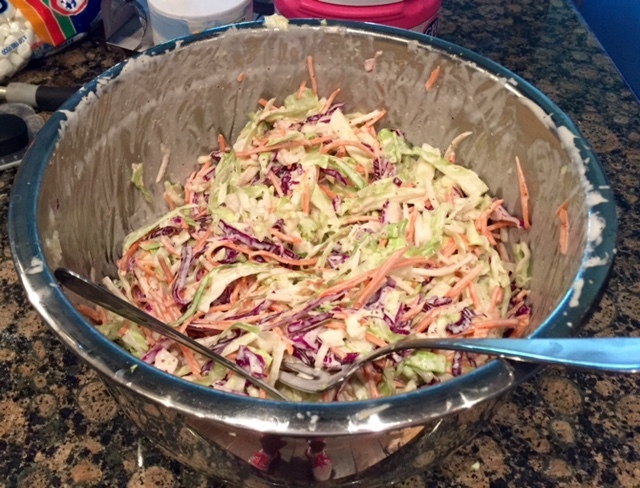 I Like My Coleslaw With a Kick! – This Girl Loves to Eat! I Like My Coleslaw With a Kick! Week 1 For the 8:00 PM game against Arkansas State, we had all day to tailgate, so we did a traditional lobster, clam, mussel & Andouille sausage boil with corn on the cob, red potatoes, and crusty bread. Week 2 It was a middle of the day scorcher in LA when we played Idaho so we took things easy by picking up “Godmother” sandwiches from Bay Cities Deli in Santa Monica. If you’ve never had one, and you are anywhere near Los Angeles, do yourself a favor and get over there! It’s unbelievably good and the line is always out the door so order ahead. Week 3 When Stanford comes to town that means one thing for our particular tailgate group: Greg’s Dad’s bloody Mary’s. They are the BOMB and thus require a suitable food performance to accompany them. The smoker was hauled out for ribs, Carl’s Fat Boy Pie (A spicy potato concoction) and my Memphis Coleslaw. Toss, cover and refrigerate at least 1 hour. It tastes the best when salad sits overnight in the refrigerator. Makes a good sized bowl and can feed 8-16 depending on serving size. This girl loves to eat this as is, but if you like more crunch you can also add finely diced celery, green apple or even some radish. For more kick you can add another TBLS of the Creole Mustard or even creamy (straight if you’re brave) horseradish. If you are having pulled pork or corned beef this would be great piled high within your sandwich. I’ve also served it with ribs, steak and alongside hotdogs & hamburgers. Posted on September 23, 2015 March 17, 2016 by ls1228Posted in Side DishesTagged Arkansas State, Bay Cities Deli, coleslaw, Godmother, Idaho, Memphis, Pulled Pork, RIbs, Stanford. Bloody Mary's, USC. Pingback: Pressure Cooker “BBQ” Brisket – This Girl Loves to Eat! Pingback: Bloody Angry Baby Back Ribs – This Girl Loves to Eat!